Myofascial Pain Syndrome- Pamela Morrison Pelvic Pain Physical Therapist, P.C. Myofascial Pain Syndrome- Pamela Morrison Pelvic Pain Physical Therapist, P.C. Myofascial pain syndrome is a chronic pain disorder involving pain and inflammation in the body’s soft tissues and muscles. Many times there is pain referring from small tender nodules called trigger points within myofascial structures in or around areas of pain. It may involve one muscle or many muscle groups in the body as well as the fascia or connective tissue that covers the muscles. Patients usually complain of tenderness along points in firm bands of skeletal muscle consistent with prior reports. Sometimes the area of pain is not the original site of strain or injury. That is called referred pain. 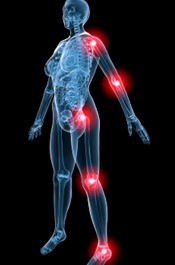 Trigger points within a muscle can cause the entire muscle to become reactive, shortened, painful, weak, and can hinder range of motion of the area. Myofascial trigger points can also respond to being stroked or plucked with a twitch response whereby one would see and feel the muscle twitch or suddenly move when provoked. Pain that refers away from the taut band being touched in a distinct pattern and having a twitch response present are clear indications that it is an ‘active’ myofascial trigger point. ‘Latent’ trigger points are dormant or inactive but have the potential to become active. Causes of myofascial pain include an injury to the spinal intervertebral discs, general fatigue, lack of activity, trauma, or other medical issues. Myofascial pain syndrome can occur after a muscle has been repeatedly contracted from repetitive motions used at work, hobbies, stress-related muscle tension, and poor postures. Often there are stress related issues or emotional upset, behavioral contributing factors, and concomitant diagnoses. Stress related activity or postures could be clenching or grinding of teeth, holding patterns in stomach, shoulders or low back, and buttock or pelvic floor muscle clenching. Associated medical diagnoses include fibromyalgia, temporomandibular disorder (TMD/TMJ dysfunction), irritable bowel syndrome (IBS), interstitial cystitis, endometriosis, chronic fatigue syndrome, chronic pelvic pain, vulvodynia, insomnia, and depression. The discomfort from myofascial pain syndromes persists or worsens overtime unless treated. Misdiagnosis or inadequate medical management can result in a Complex Regional Pain Syndrome (formerly referred to as Reflex Sympathetic Dystrophy or RSD) which can become chronic so early identification via diagnostic testing and proper evaluation is crucial. We are excellent at identifying this syndrome. Medical management often occurs with a Physiatrist, a rehab doctor, and can include trigger point injections or antidepressants. Physical therapy with manual therapists is always a recommended effective treatment. How can Pamela Morrison Physical Therapy help with Myofascial Pain Syndromes? Your expert physical therapist will perform an extensive history of your prior medical and physical issues. Understanding how your function has been affected is of prime importance. The physical therapy exam for myofascial pain begins with a thorough postural, movement pattern, and gait analysis. The area or areas of complaints are then assessed for range of motion, flexibility, joint mobility, and special orthopedic tests are performed for ligamentous testing and to rule out other orthopedic diagnoses. Neurological testing of the areas occurs to make sure that there is no nerve irritation, neural tension, traction injury, or sensation impairments. Careful palpation of the local area(s) of complaint and associated areas of complaint is performed. Through our experienced manual skills, we are able to identify whether there is a tender point (area of pain that is directly under our fingers as we palpate) or a myofascial trigger point (area of taut muscle/fascia that when touched refers pain to another site). Both can exist in the same area. Treatment would focus on resolving the myofascial trigger points, resolving pain, and restoring function. Treatment would consist of advanced myofascial release techniques including massage, specific techniques that target the trigger point, active release techniques, functional mobilization techniques with movement patterns, and skin rolling. Joint mobilizations to correct misaligned joints are performed which results in proper muscle balancing around the joint. Modalities such as therapeutic Ultrasound, cold laser, electrical stimulation, TENS (transcutaneous electrical nerve stimulation), ice massage, instant ice spray, and moist heat may be utilized to further soften or break up the trigger point and for pain relief. Re-education of movement and posture, stretching and strengthening exercises are also instructed. Relaxation training and deep breathing are important components of the rehab program to help to down-regulate the nervous system which could be in a flight or fight pattern causing a cycle of stress related pain. Meditation, yoga, Qi-gong, and deep breathing methods are very helpful. An important part of your therapy may be instruction in a home exercise program which compliments what is done in the physical therapy treatment sessions. Use of foam rollers, Therawand (a rehab device that helps apply pressure directly to the trigger point), self massage devices, and tennis/rehab balls to self release the trigger points are employed.